In 2006 Lucio founded the ‘First of All’ booking, management and promotion agency with collaborators from different parts of Italy working together to support bands selling merchandise, organizing events and tours. The same year as the founding member, singer and composer of ‘Bavarja’ recording three full production demos they played over one hundred shows and events during that period. 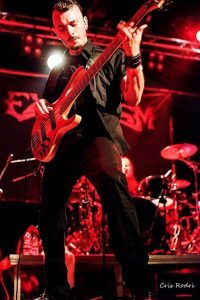 Following this he was asked to join ‘Solid Vision and Captivity Trio’ with Solid Vision’s founder members Brian and Yan Maillard, a widely known progressive-metal band recording the album ‘Sacrifice’ (2010), ‘Eleven 11\11\11 (DVD LIVE) (2011), the ‘Apocalypse’ (Official music Video) and touring in Europe managed by MAM AGENCY NL. 2011 he started work with the band ‘Dominici’ with Charlie Dominici the original singer of ‘Dream Theater’. December 2012 saw his first solo instrumental album ‘Everybody Needs an Angel’ release followed with the official music video ‘Scorched Earth’ in March 2013, produced by ‘Noise Head Records’ Austria. That same year he signed his endorsement collaboration with ‘Mogar Music’ Italy for Ibanez guitars and ErnieBall strings. Following this he replaced ‘Craig Gruber’ original bassist of ‘Rainbow’ and ‘Elf’ in the multinational Heavy Metal band ‘Raven Lord’ featuring US guitarist ‘Joe Stump’ recording the album ‘Down the Wasteland’. Signed to ‘Mausoleum Records’ they played summer shows in the UK followed by the ‘R-Mine Metalfest’ festival in Belgium with ‘Symphony X, Masterplan, DGM’ and many others. He also worked with ‘Exorcism’ another multinational Doom Metal project signed to ‘Golden Core Records’ part of ZYX Music, Germany and recorded bases on the album ‘I am God’ 2014 and the EP ‘World in Sin’ 2015 as well as being featured in the official music video ‘Higher’. Exorcism played shows in Europe including ‘Dokk’em Open Air’ festival with the likes of ‘Death, Annihilator, Metal Church, The Dillinger Escape Plan, Gamma Ray and Napalm Death’. 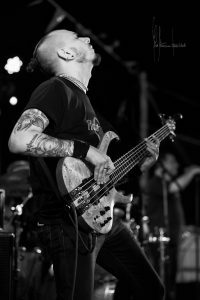 2014 Lucio collaborated as a singer with the Sludge\Metal studio project ‘Iknausea’ releasing the album ‘What Really Pissed Me Off’ and also finished the recordings for a number of other international projects. In 2015 collaborating as a session man with the Greek band ‘Jaded Star’ took him to shows in Athens and Thessaloniki to support the band ‘Epica’ on their “Greek Enigma Tour”. He then received an official endorsement with the Greek brand ‘Warlord Custom Pedals’ making the ‘Lucio Manca’ signature distortion pedal ‘The Quake’ and ‘Cronos’ delay unit . Throughout the years of making great connections due to his reliability and unique understanding of music, bass and composition he has had other opportunities come to the table working with Grammy nominated producer and writer Rick Hale, Garry King (Joe Lynn Turner, Jeff Beck, Sound of America Records), Joe Stump (Berklee College of Music, Reign of Terror, Holy Hell), John Macaluso (Yngwie Malmsteen, Ark, TNT) James Labrie), Pino Scotto (Vanadium, Fire Trails), Rich Smith (Power Quest), Thiago Trinsi, Alex Landenburg (Luca Turilli’s Rhapsody, CyHra, Kamelot and more), the Sardinian rapper ‘Su Maistu’ as well as various recordings released for ‘Audiosparx’ US industry-leading music library and orchestration for films, TV and games . 2016 saw the release of his second solo album ‘An Old Man’s Sad Story’ featuring Garry King (Joe Lynn Turner, Jeff Beck,) on drums out on CDBABY. Later that year he started his collaboration and partnership with Garry and writer ‘Paul Jupe’ for the Country Rock project A.G.D ‘A good Day’ which has been featured on BBC Radio UK and received some great industry reviews in Nashville TN. 2016/19 has seen Lucio as busy as ever both live and in the studio with the band ‘Tamurita’ produced by Joxemi (Ska-P) and SP Produzioni. He recently created and produced the new single ‘Tu Sei’ and shared the stage with ‘Creedence Clearwater Revived’ for their ‘Sardinian Tour’, Max Pezzali, Punkreas, Lo Stato Sociale and more. He has continued with clinics and master classes in Sardinia with the collaboration of several private schools. The videos taken from his last solo album ‘An Old Man’s Sad Story’ have been supported, sponsored and shared by many influential pages and sites from the music community all over the world including ‘Bass Love, Bass The World, Bass Musician Magazine and Vic Firth’. 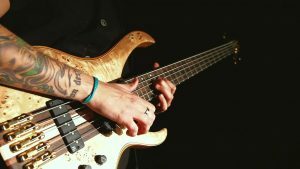 Now as a recording artist at ‘Got Your Six Music’ UK he has been sought after for his talents as a session bassist for other band/recordings worldwide. 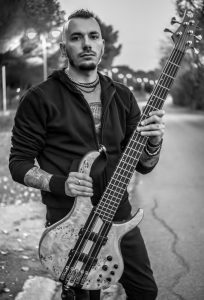 Lucio Manca is currently working on the production of his third anticipated solo album along with a second ‘A.G.D’ record that will both come out later in 2019.